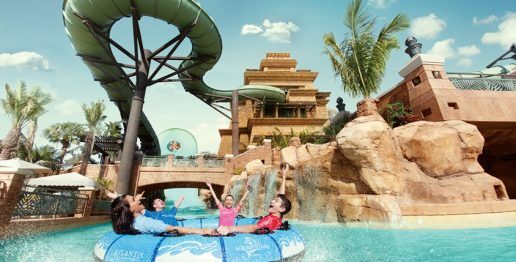 Unlock Endless Adventure at Atlantis Aquaventure with the Brand New 2-Day Mega Pass! We have a special treat for you at Atlantis Aquaventure Dubai. Come and experience all our family-friendly marine and water park attractions across two whole days with many amazing benefits added in, including access to Aquaventure Waterpark , The Lost Chambers Aquarium and a Dolphin Performance. You no longer have to rush around Dubai’s best water park to enjoy it all in one day; with the all-new Aquaventure Two-Day Mega Pass, you can enjoy two full days of waterpark experience from just AED 250 per person ( for UAE residents) and AED 350 (for non-residents). 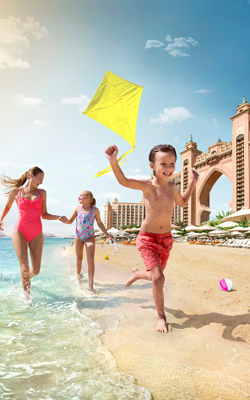 Home to over 30 thrilling water slides and attractions, 2.3km of interconnected Rivers Rapids, kids play area, Splashers Island, the UAE’s coolest Surf’s Up wave rider, 500 meters of private beach line, marine animal encounters and experiences, Atlantis Dubai is the ultimate water attraction for thrill seekers. Whether you are looking for huge thrills or an experience to settle your heart rate – there is a ride for everyone at Atlantis Aquaventure and several attractions and experiences for the entire family to explore – take the heart-racing ‘Leap of Faith’, a ride that is tried by nearly 600,000 guests every single year; marvel at 65,000 marine animals at Dubai’s largest Aquarium; and be amazed by the dolphin performance at one of the most sophisticated dolphin habitats in the world. With the 2-Day Mega Pass, you save big on visits to Atlantis Aquaventure and The Lost Chambers Aquarium with your friends and family! The Mega Pass also gives you access to various aquarium shows including a shark feeding, unlimited rides on the new Surf’s Up wave rider as well access to other awe-inspiring experiences. With so many incredible attractions to see and experience, you no longer have to cram your Aquaventure to-do list into a matter of hours. What’s more, the two-day ticket is relatively flexible and does not have to be used in consecutive days – you can visit the attractions over the course of three days, saving you time for other resort activities. 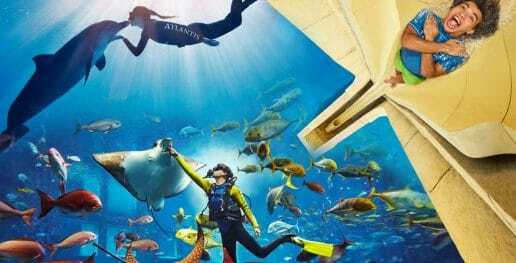 The two-day Mega Pass is a must-have if you are planning on visiting Atlantis Aquaventure, The Lost Chambers Aquarium and Dolphin Bay during your vacation. When you purchase a Mega Pass, you also save money! The pass bundles many attractions into one purchase with a set price. The cost of each Mega Pass is equal to less than two individual one-day park tickets, after two visits your pass has already paid for itself. 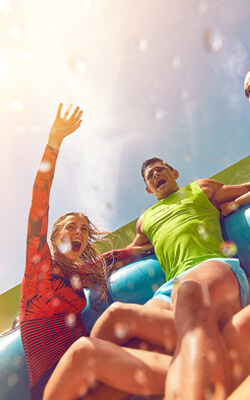 Get the adrenaline pumping as you slide down record-breaking water slides at the #1 waterpark in the Middle East and Europe, right here in Dubai! Step into Dubai’s largest Aquarium, home to 65,000 marine animals including sharks, stingrays and thousands of colourful fish. Learn about the world’s most sophisticated mammals – the dolphins at our Dolphin Educational Performance. Watch our Scuba Divers and Marine Animal Educators dive the depths to feed the marine life including sharks and rays at the Ambassador Lagoon and Shark Lagoon. 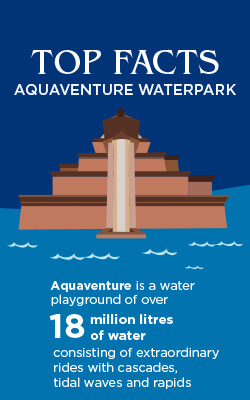 Other Aquaventure Passes Available This Season! 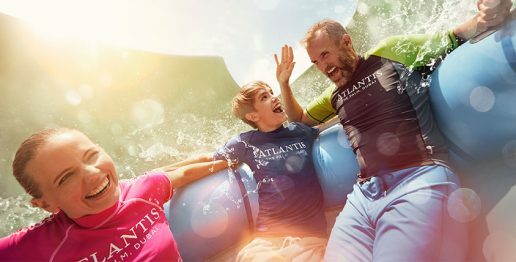 If you have just a day in hand and want to make the most of your time at the region’s #1 water playground, buy the 1-Day Super Pass with exclusive access to Atlantis Aquaventure and The Lost Chambers Aquarium for a full day of action-packed entertainment at Atlantis Dubai. Buy your Super Pass using the special UAE Resident Rate and save 40% off on your visit to Atlantis Marine Waterpark. The Annual Pass lets you enjoy 365 days of unlimited access to Atlantis Aquaventure along with many amazing exclusive benefits across the waterpark. If you are looking for more action, check out a selection of fun experiences and things to do in Dubai that should be on your bucket list. Ready to make a splash? Buy your Aquaventure 2-Day Mega Pass online today to elevate your Atlantis experience with your family and friends. Get Ready for an Eggciting Time at Atlantis Dubai this Easter!